Every year, The Gardiner Museum kicks off the Toronto holiday season with their elegant and artistic 12 Trees exhibit. This annual exhibit showcases unique interpretations of Christmas trees artistically decorated by some of Canada’s top designers and institutions and sponsored by supporters of the arts. This year, the Ukrainian Museum of Canada (Ontario Branch) was honoured with an invitation to participate in this prestigious event. The Ukrainian Museum of Canada, located at St.Vladimir Institute in Toronto, is celebrating over 70 years of preserving and sharing Ukrainian heritage in Canada. Formed within the Kn. Olha Branch of the Ukrainian Women’s Association of Canada, this extraordinary group of volunteers meets regularly and strives to teach and promote Ukrainian heritage through unique and elegantly curated exhibits. For the 12 Trees exhibit, the museum was in great company, exhibiting their creation along with leading Canadian artists and designers such as Jane Waterous, Suzanne Shaw for Holt Renfrew, Jennifer Carter for Hermès and others. Contributors were asked to “re-think” and present an interpretation of a traditional Christmas Tree. 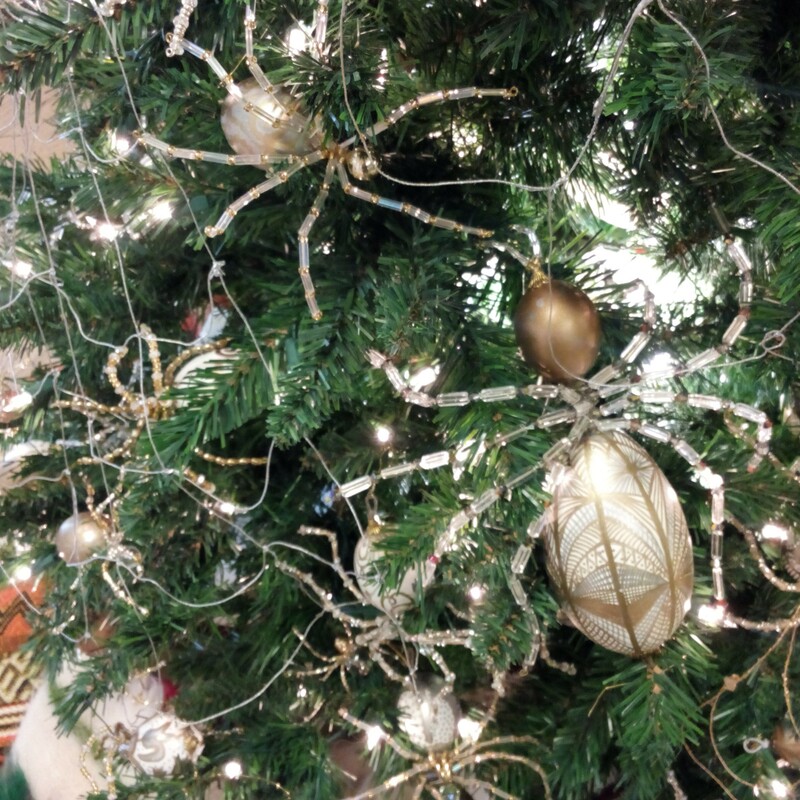 The Ukrainian Museum chose to present to Torontonians the Ukrainian legend of the spiders who cover a poor widow’s yalynka with golden and silver webs on Christmas Eve, bringing joy and happiness to the widow and her children with their beautiful sparkling designs. A team of volunteers spent months creating dozens of spiders for this yalynka. 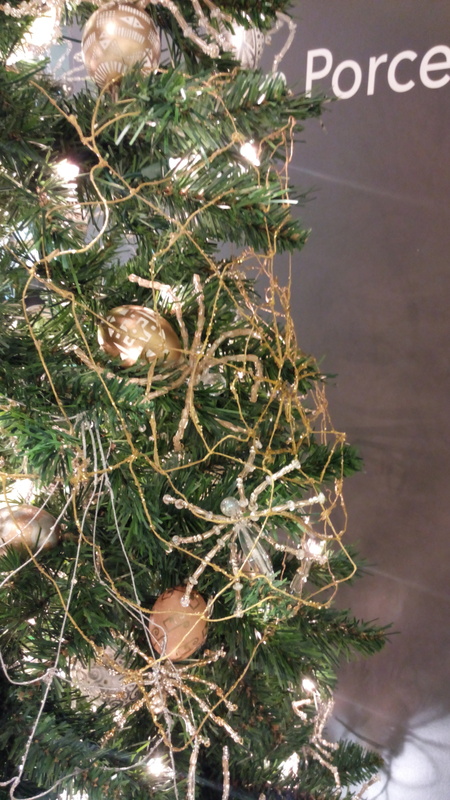 Each spider on the tree is constructed of chicken, duck, quail or goose eggs, hand-blown and decorated with intricate gold and silver patterns, glass beads and Swarovski crystals. I visited the Gardiner Museum earlier this month to check out the exhibit and brought along my favourite toddler. Yes…bringing an active 3-year old boy to a ceramics museum really is the literal equivalent “a bull in a china shop”! …but I’m happy to report that The Gardiner Museum (and all 12 Trees) are still standing! The yalynka, and the entire exhibit is truly extraordinary to see! Other incredible “trees” include ballerinas “frozen” in rotating plexiglass, projected hands, a gigantic Reader’s Digest tree, a tree of Hermès umbrellas, crowns from the Stratford Festival, and others… And although the Ukrainian yalynka was the most “traditional” of the non-traditional trees on exhibit, I found myself mesmerized by the uniqueness of each of the spiders and their intricate patterns! The 12 Trees exhibit is on display until January 3, 2016. For hours, admission and more information about this exhibit, visit www.gardiner12trees.com and do try to visit! There is much more to see at The Gardiner Museum! The trees are truly amazing! !